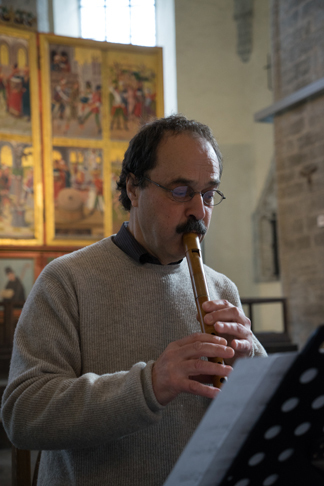 Conrad Steinmann pursued his recorder studies at the Schola Cantorum Basiliensis, where he has been a professor since 1982. He has given concerts, classes and lectures throughout Europe, Japan, Australia, South America and regularly in the Near East. He can be heard frequently with the recorder ensemble diferencias, ensemble 415, London Baroque and with his ensemble Melpomen which presents his unique research on the field of Ancient Greek music. Steinmann has also initiated cultural exchange programs, including Jadal with the Arab music world in Basel and Cairo in 2001. His recordings include: solo album Echo and Vivaldi recorder concertos Giorno e Notte (Divox), Swiss Made (diferencias) and Melpomen (Harmonia Mundi) - music for an Athenian symposion of 450 BC, which received a Diapason d'or and Sappho and her time (Sony) which includes music and lyrics from the 6th century BC.